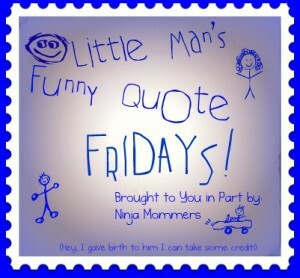 Funny Kids Quotes - Little Man's Funny Quote Fridays! Well here we are, back with our funny kids quotes and Little Man’s Funny Quotes Friday! If there is a time of day that I am ever in a “Mood” it’s usually the morning. I am not much of a morning person, unless I get to wake up on my own, get my coffee and take the puppy outside and enjoy the front porch. IN. SILENCE. So, this morning I got up, took puppy outside, got a coffee and retreated to my porch. 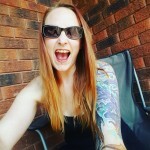 I was sitting there in silence, just how I like it when all of a sudden out of nowhere there was a loud noise behind me, before I knew it there was a little man coming flying out of the door in only his underpants. That was almost too much to take in at 7am. But I got there. Eventually. That’s awesome! Souns like my son. He’s seven and says stuff like that all the time. Your little guy has a great imagination! It sounds like he came looking for his mommy and decided to give you a creative explanation of what happened! Oh those silly grumpy old legs… rofl… I love hearing smiles like this out of my little ones mouth. Kids says the funniest thing, but not so great at 7am lol! That is definitely too early.